A trial was conducted to determine the possible effects of an easily digestible nitrogen source in the form of urea compared to an undegradable protein supplement, age and birth status on the reproductive performance (ovulation rate and rate of twinning) of ewes. The weight, age and birth status of Döhne Merino ewes were recorded. A total of 144 Döhne Merino ewes were randomly allocated in two dietary treatment groups (either urea-based or undegradable protein group) synchronised, mated and the ovulation rate (estimated from the number of corpora lutea on the ovaries), foetuses observed on day 55 of gestation, lambs born per ewe and mass of the ewe after lambing were recorded. 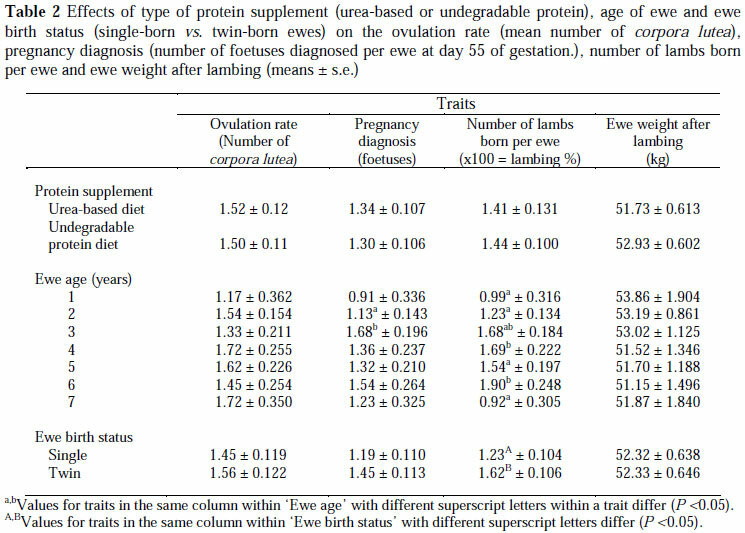 Dietary protein supplement had no significant effect on ovulation rate, pregnancy status, the number of lambs born per ewe or ewe weight after lambing. The number of lambs born per ewe of the one-year-old (0.99 ± 0.316), two-year-old (1.23 ± 0.134) and seven year old (0.92 ± 0.305) ewes were lower than that of four (1.69 ± 0.222) and six-year-old ewes (1.897 ± 0.248). Ewe age did not influence the ovulation rate of ewes, but the highest number of foetuses counted on day 55 of gestation was observed in 3-year-old ewes (1.68 ± 0.196). The number of lambs born per ewe of single born ewes (1.23 ± 0.104) was lower than that of twin born ewes (1.62 ± 0.106). It was concluded that dietary protein supplementation had no significant effect on ovulation rate or the number of lambs born per ewe mated, while age and birth status influenced the reproductive rate of Döhne Merino ewes. There has been a number of studies on the possible effects of a high protein intake (daily protein intake > 125 g/ewe per day, Smith et al., 1983; Smith, 1991) and dietary protein to energy ratio's on ovulation rate and subsequent embryo survivability (Knight, 1979; Rhind et al., 1989; Waghorn et al., 1990; Nottle et al., 1997). These experiments have produced conflicting results (Parr et al., 1987; Rhind et al., 1989). It has also been suggested that different protein sources may have beneficial effects on ovulation rates in sheep (Knight et al., 1975), but it appears that the benefits obtained may be due to a lower level of protein degradation in the rumen and subsequent availability of protein in the lower digestive system. The latter is supported by the failure of increased dietary nitrogen in the form of urea to increase ovulation rates (Smith et al., 1983; Landau et al., 1987; Fahey et al., 2000). These researchers suggested that heat treatment of protein sources may reduce the rumen degradable protein fraction, but the effect on the reproductive performance of ewes is uncertain. The cost of protein supplements in feeds is high in modern small stock production systems in South Africa, so supplementation is only beneficial if there are improvements in terms of production and reproductive rates. The aim of this study was to determine the effects of either an easily degradable nitrogen source in the form of urea compared to an undegradable protein supplement on the reproductive rate (ovulation rate and rate of twinning) of Döhne Merino ewes under local conditions. A total of 144 Döhne Merino ewes ranging in age from one to seven years were stratified according to live weight and randomly allocated to one of two dietary protein treatment groups (urea-based diet and an undegradable protein diet), blocked for ewe age and birth status of each ewe. The animals were fed Fescue grass ad libitum and were supplemented with 250 g/ewe/day of a urea-based or an undegradable protein diet (Table 1). Ewes were mated by the same ram and ten days later the number of corpora lutea on ovaries were identified and counted by laparoscopy to estimate ovulation rate. Pregnancy (number of foetuses observed per ewe) was diagnosed on day 55 of gestation by means of an ultra-sound scanner. Numbers of lambs born per ewe and weight of ewes after lambing were recorded. The effects of age, birth status of the ewe, dietary protein treatment and their interactions were analysed by analysis of variance (ANOVA) of SAS (SAS, 2004). Breeding mass was used as a covariate in both trials and the response variables included the number of corpora lutea, pregnancy diagnosis at 55 days of gestation, number of lambs born and ewe mass after lambing. Means were compared by means of the Bonferoni multiple range test at a significance level of P<0.05. The results indicate that dietary protein supplement had no significant effect on any of the traits measured (Table 2). These results agree with that reported by Rhind et al. (1989), who concluded that there is no clear-cut consensus regarding the effect of protein supplements on the reproduction rate of ewes. It is interesting to note that in the present study, the number of lambs born per ewe was marginally higher in ewes fed the undegradable protein supplement (cotton seed oilcake), despite the fact that both the ovulation rate (number of corpora lutea counted 10 days after mating) and the number of foetuses counted on day 55 of gestation were marginally higher in ewes fed the urea-based diet. This trend suggests a possible negative effect of urea supplementation on embryo survival, which agrees with the results of Gath et al. (1999). The results of Steward & Oldham (1986) suggest that feeding undegradable proteins for four days during the luteal phase, may increase ovulation rates, but not necessarily the number of lambs born per ewe. More research is necessary to confirm this and explain the mode of action. As can be seen from Table 2, there was an increase in the number of lambs born per ewe as the age of ewes increased and at 7 years of age, a decline in lambing percentage was noted. Notter (2000) also found that prolificacy differed (P<0.001) among ewe age groups in all breeds of sheep. Peak prolificacy was generally achieved between four and eight years of age. The general trend observed in the present study (Figure 1) agrees with that reported by Notter (2000), but lambing percentage started to decrease after 7 years of age under local conditions. Ewe weight after lambing did not differ between dietary protein treatment groups. The number of lambs born per ewe for single born ewes was lower (P<0.05) than that of twin-born ewes (Table 2). The twin-born ewes produced 14% more lambs than the single born ewes in this trial. This finding strongly supports the suggestion that twin born ewes have a higher lambing percentage as compared with single-born ewes. No significant differences in the number of corpora lutea counted 10 days after mating, the number of foetuses counted on day 55 of gestation, or ewe weight after lambing were observed between single-born as opposed to twin-born ewes. Dietary protein supplement did not influence the ovulation rate, pregnancy status, the number of lambs born per ewe or ewe weight after lambing of Döhne Merino ewes in this experiment. Ewe age did not influence the ovulation rate of ewes, but affected the number of lambs born per ewe, which increased with age of the ewe up to 7 years of age, after which the number decreased to levels comparable with that of oneyear-old ewes. Ovulation rate and number of lambs born per ewe of single-born ewes were lower than that of twin-born ewes. It was concluded that dietary protein supplementation had no significant effect on ovulation rate or the number of lambs born per ewe mated, while age and birth status influenced the reproduction rate of Döhne Merino ewes.